On a more serious note, after the fall of apartheid in South Africa, a lot of white nationalists hold up Israel as an example of a country run by one ethnic group to the exclusion of another. True... and they can't even see the Democrats are pushing Communism as "Socialism" and more Government control. Adolf Hitler literally had Jews sent to camps where they were starved and shot. Their bodies were placed into oversized actual ovens, where the dead bodies would later be used as fuel to burn more bodies. If you think Trump will do that, you're a misguided moron! And to be fair, Communism is arguably worse than Nazism. Am I justifying Nazism? Hell no! They're both evil far-left movements. 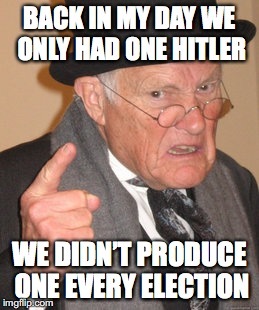 That's why Godwin's law is a thing. The vast, overwhelming majority of the time when people compare political figures they don't like to Hitler, they have absolutely no idea what they're talking about. They don't like him, so he's Hitler. 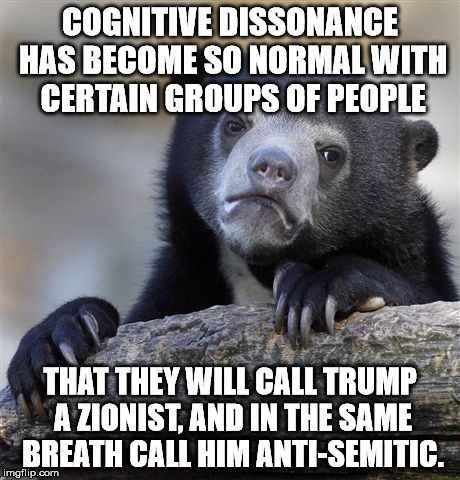 That's why I don't do it anymore, even when somebody is actually acting like Hitler. It's pointless, and it's not like he was a one of a kind, either. Nationalism, scapegoating and bigotry are the closest comparisons to Hitler. 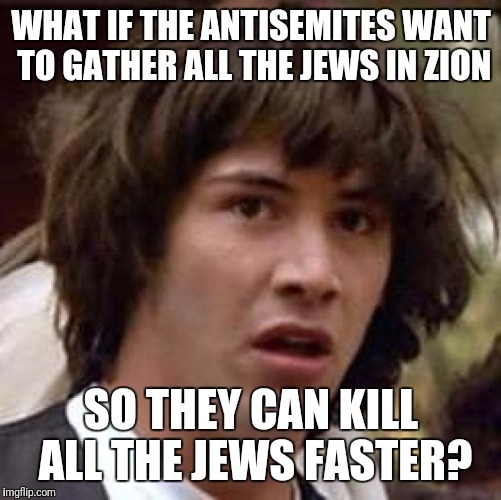 I don't know anyone that thinks Trump is gonna round up Jews and kill them. However registries were used by Hitler to track Jews much like is being suggested by Trump with Muslims. There are a bunch of similarities. If you don't see them and at least acknowledge them you're lying to yourself. So do you also compare FDR (rounding up the Japanese Americans in concentration camps) to Hitler? If I was alive then I am not sure how I would have reacted. again, all out war makes weird things happen...like nationalism. Do you think that we are at war with radical islamists? I think it's tough to win a war against something that has no borders. Like the war on drugs. A "war" on drugs is such a war. As is a war on ISIS or a "war on terror" in general. Are we "at war?" in a manner of speaking.....I just don't think such "wars" are easily won...or even fought. So to call them "wars" is disingenuous at least. We are spending A LOT of money to drop A LOT of bombs. I don't see that happening with ISIS/radical islamic terrorists. Nationalism? Seriously? You say that if it's a bad thing. Trump isn't a power grabbing gun grabbing socialist. you don't understand the severity of the Holocaust, as you just compared it to a recanted statement. The similarities end when it comes to policy. Bybthe way...Nationalism is not patriotism. I'm all for patriotism. Nationalism gets a little sticky though. It's not necessarily great. It can help bind/bond during times of great danger like all out war. But it can push too far and not so great outcomes can happen. I don't see how not wanting jobs outsourced will push it too far. Someone is downvoting my comments b/c I have a nice long wait between being able to comment. The author explains how both use similar tactics and emotions. Also that they aren't "the same" as I said. Trump isn't Hitler. But there are similarities. As I said, they had similar strategies to get elected. That means nothing. No, there are also fiscal policies to compare. Which are very different. I don't understand which side you're on. I'm a libertarian, which means I'm a political fence-sitter when the Donkey and the Elephant squabble. 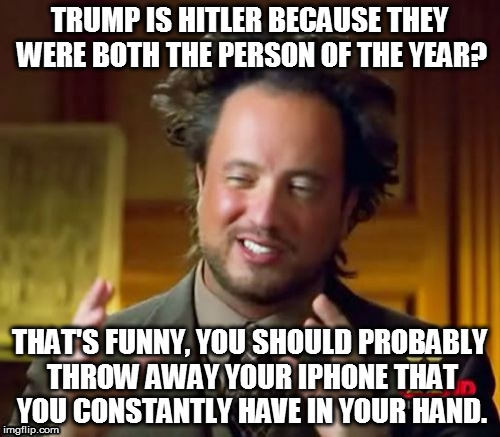 However, I agree with the meme; leftists use the False Equivalence logical fallacy (ie, "They're bother Time Magazines person of the year so they must have the same political views) to try and convince gullible liberals that Trump will finish what hitler started. You'd have to be brainwashed by a cult to believe this ludicrous conspiracy theory. "If you compare" that means you successfully compared, so you should know what you're talking about, otherwise you wouldn't have "compared", but you would have "tried to compare". 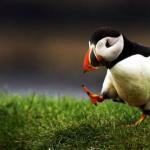 Nitpicking my meme and pointing out errors that are subjective do not further your argument. I don't know what you mean by nitpicking, this is on like the first or second page right? And, I don't have an argument, only a lesson. The point is that you cannot successfully compare Trump to Hitler, and if you think you can, you don't know what you're talking about. Trump stood in front of a podium, so did Hitler. And that is as far as the argument goes. 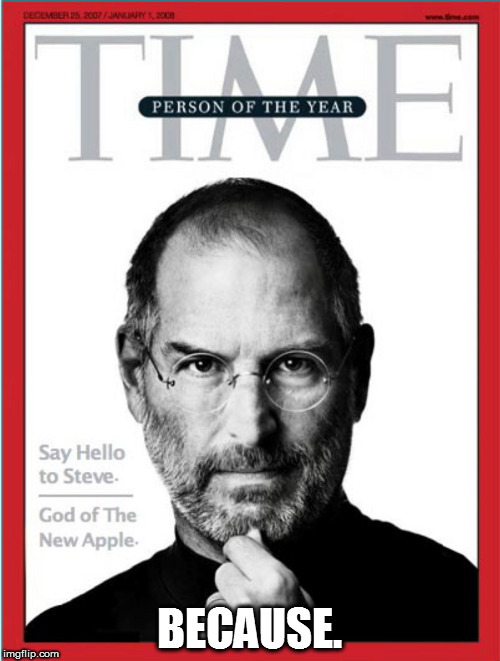 I was using "compare" meaning: "be of an equal or similar nature or quality." I know, I was just messing with you :) sorry. I just have days when I need to mess with people on the internet, or else I will hurt someone's feelings in real life. Yet he sides with the most bigoted people on the planet: Rick Perry, Steve Bannon, Mike Pence, you name it. I think both liberals and conservatives will find this 5-minute game... enlightening. Do you think the moral of the story is one we should share? I am neither a liberal or a conservative. I will still take it, though. Guilt by association. Dare I mention the fact the Bernie is supported by communists? That comment threw me so off when i read it as "guilt by assassination". The point is that disliking someone because someone bad likes them is ignorant. False. Hitler was a socialist that persecuted communists and Spanish republicans. Not that it matters. And your second paragraph has no support. How, specifically, is he racist? And racism =/= always a Nazi. Doesn't matter though, cause he isn't racist. I disproved Trump bring racist before, and the liberal I was discussing with kept trying to deflect because I put him in his place. He was wrong. You'll never convince them. You can show then all the evidence in the world and they will still be willfully ignorant. Kiss America goodbye? If I'm wrong I swear I would be the first to admit it. However, Mark my words my friend, we will see an economic boom so enormous another liberal won't destroy America after! Because that's what you do. Always. Lol! LOL! When some conservative thinks the Economy was destroyed by Obama, even though he was REALLY trying to fix up BUSH'S MESS!! That's the problem with you guys: you lie. You said you'd admit that you were wrong, then you said that liberals destroy the economy, even though BUSH did that back in HIS presidency! Also, how "destroyed" was America's economy during Bill Clinton's presidency?! Homophobe? Really? You're a bigot. You assume all of us are such. I have 2 gay friends they're freaken awesome! Dude, your the one that's messed up. You have no idea about the real world. None at all. It's sad. 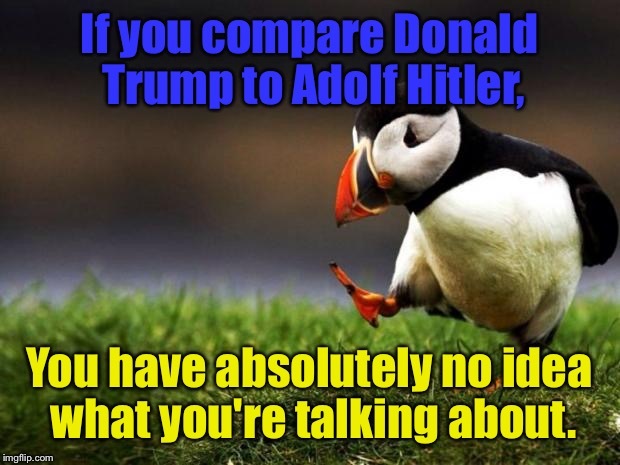 If you compare Donald Trump to Adolf Hitler, You have absolutely no idea what you're talking about.